"I'm so tired of being a nice guy. I just want to change into something else." In this latest DVD release in the Creature Feature series, we are again treated to a new film based on the title, and title only, of an old Samuel Z. Arkoff monster movie from the 1950s. The first title in the series (She Creature) was well done and eerie, but Earth vs. the Spider tries to take a campy slant on the Spiderman mythos, and fails mightily. Quentin (Devon Gummersall) is a nerdy security guard at Biochemco, and when he's not pining for Stephanie (Amelia Heinle), his cute nursing student next-door neighbor, he's absorbed in the world of his favorite comic book hero, The Arachnid Avenger. When some crooks invade Biochemco, and murder his partner, Quentin decides to inject himself with a mysterious drug made from spider's blood. The injection gives Quentin some strange cravings, and he soon develops some very spider-like tendencies, including the ability to feel vibrations and shoot webby junk out of his chest. The idea behind Earth vs. the Spider is that his new found powers can enable Quentin to become a superhero, like The Arachnid Avenger, but there is a darker side effect to the metamorphosis. Detective Inspector Jack Grillo (Dan Aykroyd), a man branded with the inability to fire his gun in important situations, is the one who eventually tracks down the Quentin/spider creature, but Aykroyd flounders here and delivers a one-note performance that seems lifeless and phoned in. Theresa Russell has what amounts to a glorified cameo as Grillo's slutty wife, and her presence seems equally pointless. Like Jeff Goldblum's Seth Brundel character in The Fly, Quentin slowly begins to change into a spider, and it becomes increasingly more difficult for him to differentiate between good and evil. The Stan Winston creature effects are hip, though they seem to take forever to finally occur, and while this is a decidedly cheap-looking film, the spider transformations are handled smoothly and look fairly creepy; it's just too bad they're wrapped in a forgettable, simplistic script. 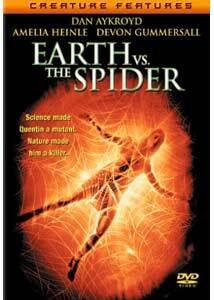 Effects alone can't save a weak script, and Earth vs. the Spider heartily reinforces this. Image Transfer Review: The preferred 1.85:1 widescreen transfer (a 1.33:1 pan & scan version is also available as a menu option) is consistent, just not significantly impressive. Fleshtones hold their own, and the steady golden color palette looks nice, but doesn't lend much credence to the whole campy comic superhero feel that the film tries to convey. Black levels are generally solid throughout. There is a bit of edge enhancement, most obvious during exterior shots of Quentin's apartment building. No specks or nicks were evident on this transfer. Audio Transfer Review: The 5.1 Dolby Digital track is pretty lively, considering the fact that this is a low-budget cable movie. The opening title sequence makes full use of the fronts and rears to create a little aural depth of field, and there are a handful of moments during the course of the film that provide a slightly enhanced soundfield. For the most part, though, it's primarily concentrated across the front channels, with occasional accents in the rear. Extras Review: While the first Creature Features disc (She Creature) featured a Stan Winston commentary, Earth vs. the Spider is treated like the red-headed stepchild, and rightfully so. A photo gallery, which is broken down into four sections (Monster Sketches, Building the Monster, Behind the Scenes, and Production Stills) features over 90 images from various aspects of the film's production. An HBO commercial disguised as a featurette (01m:45s) mixes some behind-the-scenes footage, but the brevity really contributes to its lack of any real content. Trailers (Creature Features, Urban Legend, Fright Night, I Still Know What You Did Last Summer, Thir13en Ghosts), 28 chapters, weblinks to the Distant Corners website and Columbia TriStar's generous multilingual subtitles (English, French, Spanish, Portuguese, Korean, Thai, Chinese) round out the extras. Stan Winston's Creature Features series is tied at 1-1, with this weak entry balanced against the entertaining initial release of She Creature. The story here is shamefully weak, and seems to borrow handily from The Fly for most of its intended, but poorly executed, dramatic tension. The campy superhero parallels mostly fall flat. The spider effects are cool, but the story is d-u-l-l.